Cutting Edge Landscape & Maintenance Company Inc.
Are you searching for a reputable landscaping company for your office complex? Do you need someone to take care of your home's lawn once a week? At Cutting Edge Landscape & Maintenance Company Inc., our locally owned and operated company uses the finest products and intimate industry knowledge to provide fast, professional service you can depend on at a price you can afford. The art of landscaping combined with frequent lawn care can greatly increase the value of your individual or business property, and our qualified landscapers are ready to make this come true for you. Our professional teams specialize in the beautification of property. Because we're committed to providing superior lawn and landscaping services, we work one-on-one with each of our customers to ensure total satisfaction. From help with small lawn maintenance to large estate services, Cutting Edge Landscape & Maintenance Company Inc. provides both one-time and ongoing service, making us the only name in lawn and landscaping services you'll ever need to know. Simple things, such as a well-kept lawn and a nicely landscaped area around your home, can deter criminal activity. Burglars will look for areas of the home that may not be secure, such as overgrown grass and foliage. Regular lawn and landscaping maintenance can go a long way toward maintaining security where you live. 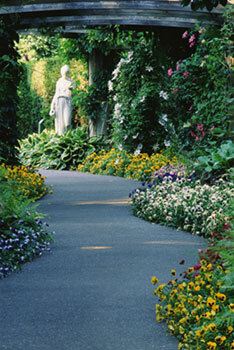 The knowledgeable landscapers at Cutting Edge Landscape & Maintenance Company Inc. are here to help! A well maintained landscape around your office or business complex projects an image of professionalism to your customers, clients, and employees. Also, by employing dependable, cost-conscious landscapers for your landscaping needs, you show your employees that you care about the value of a dollar and the concept of a job well done. Take advantage of seasonal or annual contract capabilities and make the most of your business image. We offer contract work in different time frames, depending on your needs. Our landscapers work with a pre-determined budget on large jobs, and we apply sound business and management practices throughout the operation of our company. 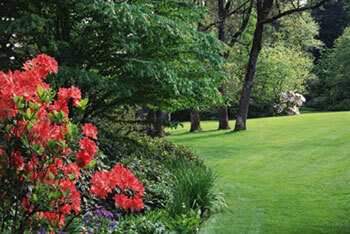 It's just one more way we prove our stability as the area's foremost landscaping and lawn care company.